On 27 May 2013, ISIS Europe attended the presentation of the latest publication of the Centre for European Studies (CES) entitled “Breaking down the walls: improving EU-NATO relations”. Hosted by the Konrad Adenauer Stiftung, the presentation included a roundtable discussion between Jamie Shea, NATO Deputy Assistant Secretary General for Emerging Security Challenges, Lauri Lepik, Ambassador of Estonia to NATO, Elmar Brok, Chair of the Committee on Foreign Affairs of the European Parliament, and Henna Hopia, Visiting Fellow at the Centre for European Studies and author of the report. The future of the transatlantic relationship was brought back to the Brussels think tanks’ agenda this week. Against the background of the current economic and financial hardship, the upcoming EU Defence Council of December 2013, and the silent ongoing review of the European External Action Service (EEAS), EU-NATO relations were this time approached with a particular focus on their European side. Henna Hopia built her argument on the improvement of EU-NATO relations on traditional ground; highlighting the common threats faced by both organisations, the need to avoid the duplication of capabilities especially at times of scarce resources, and the common operational framework of the EU and NATO, the need for cooperation was clearly presented. The second part of the paper looks at the so-called “Building blocks of the wall”: the Cyprus-Turkey issue, the inter-organisational competition and the EU’s fragmentation in matters perpetrating to security and defence. In this respect, the diverging views of Member States, the CFSP’s and CSDP’s decision-making processes, the nationalistic interests of different EU Members and the daunting lack of a clear European strategy in the fields of security and defence are in the loop. As the European Security Strategy does not appear to fulfill its strategic purpose, or simply seems to be outdated, the questions on the geographical area of interest of the EU and its framework for action remain unanswered. Yet, talks about the EU’s lack of strategic vision largely echo those abounding on NATO’s perpetual crisis and its operations-driven transformation since the end of the Cold War. The European Union, thus, is not the only one facing identity issues; the challenges ahead of NATO after the 2014 withdrawal from Afghanistan have been underlined by Jamie Shea in his Carnegie Europe policy outlook “Keeping NATO relevant”. In such a context, where can the relation between two organisations undergoing a strategic ‘soul searching’ go? Jamie Shea recommended that the upcoming EU Summit should be seen as an opportunity for the EU to review its narrative on defence. He suggested that the Union should start building a convincing narrative on why and where armed forces are needed, which would lead to tackling the issue of the type of forces needed by the EU. Resolving internal incoherence and disputes is undoubtedly a step in the right direction for the improvement of the EU’s external action, as well as for its cooperation with NATO. A similar questioning will apply to NATO once its troops return home from what has been a rather unpopular campaign in South Asia. 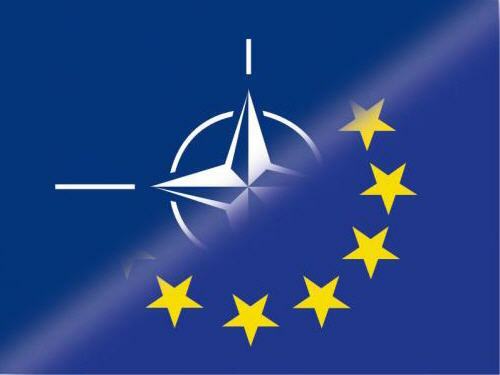 Ensuring the relevance of the EU and NATO is crucial. Yet, it will not be ensured for as long as these organisations and the government of the states that compose them do not manage to reach to their populations and provide them with a convincing and trustworthy defence narrative. Indeed, in a context where severe budget cuts directly affect citizens’ everyday lives, while their perception of security at home is increasingly challenged, the need for a more open dialogue is pressing. EU Member States and the US cannot afford to increase the gap between governments and their citizens with controversial campaigns and unclear goals in remote parts of the world. This entry was posted on 28/05/2013 by ISIS Europe in Conferences, Myrto Hatzigeorgopoulos and tagged Afghanistan, CSDP, EEAS, EU, EU Institutional Reform & Oversight, EU security, NATO, NATO reform, Transatlantic Security, US.